Most of the design of this scope can be credited to the many builders who developed the basics of open dob design; in my case of course Ron Ravneberg and his groundbreaking two-tube design, plus Dave Kriege, Ed Erbeck and others too numerous to mention -- but especially John Dobson, who will probably make fun of it mercilessly, doesn't like open designs for the most part, and nevertheless gave me some good ideas. The distinctions in this design (as far as I know, unique) are the full upper cage on a two-tube design, the clamping system, the side bearing mounts, and the paint on the bottom of the rocker box. Rather than review all facets of the design and construction, I'll concentrate on the parts most interesting to those already familiar with the basics. 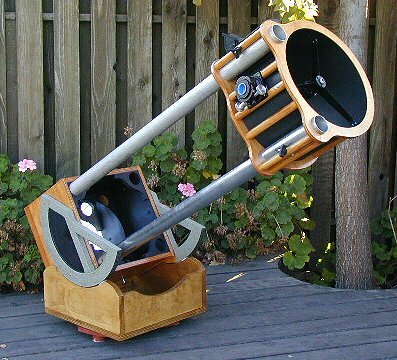 I wanted a scope that had a quick setup, held collimation, worked almost as well as a commercial truss-tube, was easier to build (fewer clamps) and, maybe most important, had an adjustable focal length for binoviewing. It's nice to hold the weight down, but it came in at about 45 pounds total -- too heavy for an ultralight, but not bad. My greatest worries about the design were: would it flop around? Would it take too long to settle? The answer to both questions turned out to be no. Settle time is well under one second from a good thump, and in normal movement there is no settle time at all. There is no measurable collimation shift with azimuth change; I have not seen any trace using either a laser or star test. Action is comparable to an Obsession. Binoviewer works great (but requires a counterweight, of course). This was all quite a relief. The entire scope fits into an area 18.5 x 18.5 x 26" (except for the tubes). The tubes have to be much longer than a typical truss, which adds a transport/space problem -- they are a bit over five feet long. Should a shroud be desired, it will be a hair trickier (I prefer to do without, but we'll see).